Opposition to an East Dunbartonshire Council decision to build a special school on the site of a village’s only football pitch is growing. Waterside residents have formed a campaign group determined to fight to save their pitch. 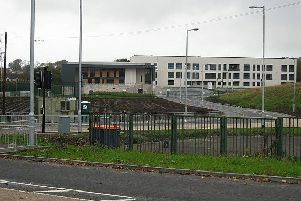 Although there is widespread support for the additional support needs school, intended as a replacement for Campsie View and Merkland Schools, many people feel the council has chosen the wrong place to build it. The council made its decision on November 15 in a full council meeting which was attended by dozens of Waterside residents keen to save the football pitch. Anyone wishing to express their views has the opportunity to contact the Scottish Government, which has the power to “call in” the decision for review. One supporter of the Waterside villagers is Ian Bowman. He said: “Under the Primary School Improvement Programme Kirkintilloch Schools were closed in preference to schools in the Bearsden and Milngavie area , even although the schools in Kirkintilloch were further down the hit list based on criteria set by the council. Submissions to the Scottish Government can be made by email at Schoolclosure@scotland.gsi.gov.uk or by post to The Scottish Government, School Infrastructure Unit, 2A (South) Victoria Quay, Edinburgh EH6 6QQ. Mr Bowman, meanwhile, said further displays of opposition to the plans were currently being decided upon.